Brennan’s premise is that at the press conference, Trump appeared to side with Putin over America’s own intelligence agencies on the issue of Russian interference in the 2016 presidential election. Putin denies what the U.S. intelligence community is telling Trump—that the Kremlin used cyberwarfare to undermine American democracy. And Trump, whose 2016 campaign is under investigation by Special Counsel Robert Mueller over suspicions of collusion with the Russian government, seems to believe Putin. 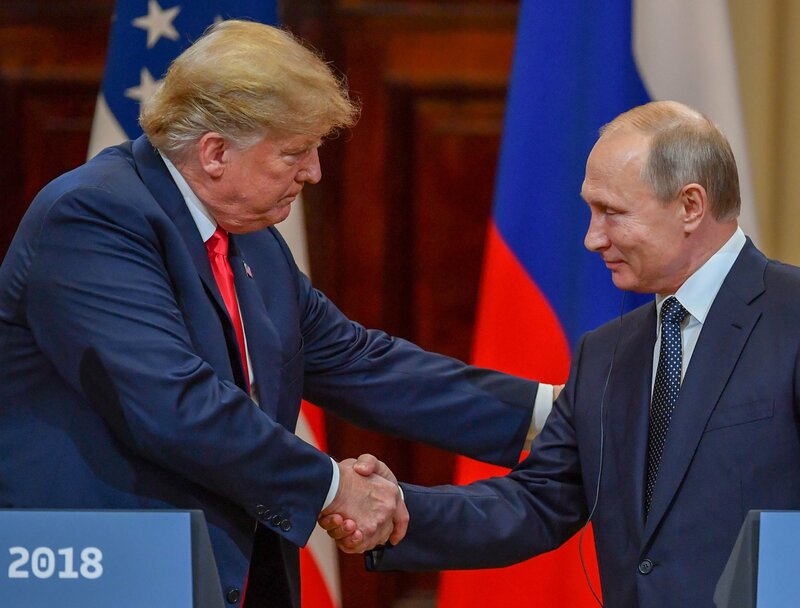 US President Donald Trump (L) and Russia's President Vladimir Putin shake hands before attending a joint press conference after a meeting at the Presidential Palace in Helsinki, on July 16, 2018. “I have President Putin. He just said it’s not Russia,” Trump told reporters after the pair met. “I will say this: I don’t see any reason why it would be… I have great confidence in my intelligence people, but I will tell you that President Putin was extremely strong and powerful in his denial today."